You are here: Home / Electric Bike News / E-Bike News: nCycle Futuristic E-bike, Solar Charging, Voltitude, Cardboard E-bike? 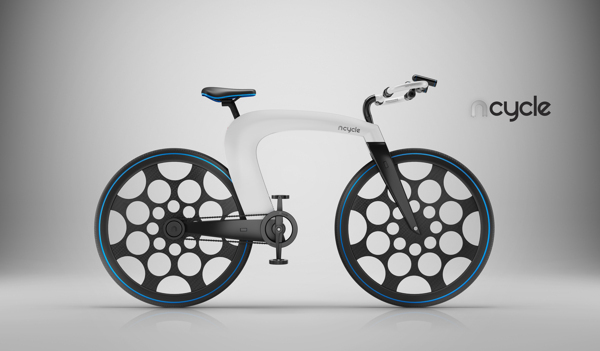 E-Bike News: nCycle Futuristic E-bike, Solar Charging, Voltitude, Cardboard E-bike? Wow! The nCycle is a new futuristic electric bike design concept that features a holographic display, smartphone integration, Bluetooth speakers, a unique integrated lock system built into the handlebars, a folding option, and more! It is definitely worth a look! The Voltitude V1, a mini folding electric bike, is set to go into production. Pretty crazy looking bike! Why 2013 Will Be the Year of the Plug-In Electric Vehicle: 10 Expert Predictions: Includes electric bikes! The Currie Technologies eFlow electric bike is currently in the top 10 of the Last Gadget Standing competition. It is the only e-bike in the top 10, so make sure you vote for the eFlow and help get the word out about electric bikes! HEVT or Hybrid Electric Vehicle Technologies, is a Chicago based company that has created an electric motor that does not use rare earth materials. They are focused on the electric bike motor as their first production motor. The carboard bicycle is set to go into production and…………there will be an electric motor option! I am huge fan of charging electric bikes with solar power and here is a great article about doing just that in India. Also, here is a guide to solar charging stations for electric bikes. The mayor of Portland Oregon just donated his Sanyo Eneloop electric bike to the City’s fleet of bikes for any City employee to ride! If you will be in the Cornwall area of England, you should checkout Cornish Cycle Tours for an electric bike tour of the area. That’s it for now…..stay tuned for more e-bike news! Why not – washing machine, 40 inches TV, microwave oven? Sometimes I wonder where those designers are living? Do they like to be just designers, or to bring something useful to the world? The icons of the design and popularity are the first VW beetle because it was cheap and affordable and high quality. The same is with Fiat500 (the old model, with new one – FIAT screw up).